The Broader Impacts Network (BIN) assists researchers in the development, implementation, and evaluation of high-quality broader impacts activities at the University of Missouri. The Chemistry Immersion Program (CHIP) at the University of Missouri-Columbia is a two-week program whose goal is to increase student interest in STEM careers and boost retention in the STEM discipline by enhancing students' comfort levels in collegiate chemistry and biochemistry. CHIP was featured on NSF's Storify! SCAPE aims to give graduate students in the sciences the tools they need to more effectively communicate their research to each other, their professional community and the public. The Big Electron is a student-run science radio show turned podcast which covers the most interesting, important, and relevant science and technology stories! To catch us live, tune in at 5 pm CST on Sundays on KCOU 88.1 FM in Columbia, Mo or kcou.fm! The Artful Science tent at the Columbia Art League's annual Art in the Park festival is where art and science have blended together to engage children in various hands-on activities. Science on Tap CoMo is an outreach program focusing on the stimulating public engagement in science and technology, while offering STEM graduate an opportunity to improve communication skills. Science Cafe Columbia is a casual group of folks who like to talk about popular science topics while relaxing with dinner and drinks. 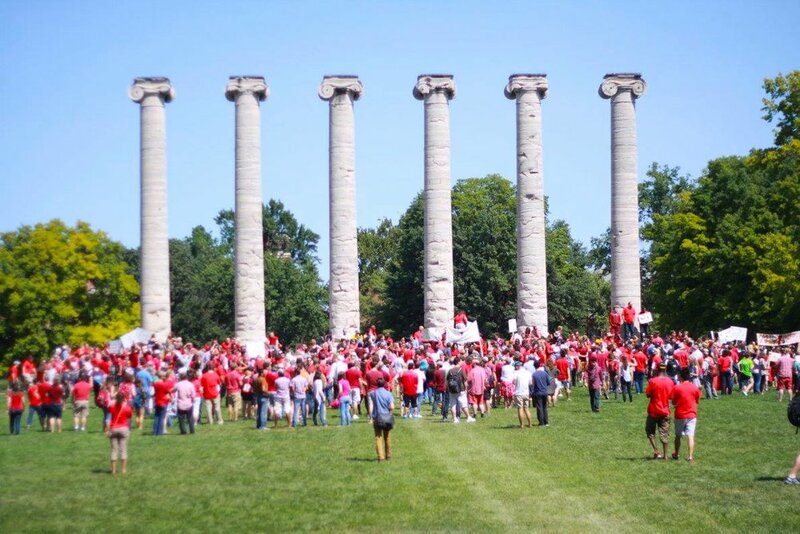 The Forum on Graduate Right (FGR) is a grassroots organization dedicated to acting on issues that affect the lives of graduate students and graduate student workers at the University of Missouri. Our concerns include providing a respectable stipend to the graduate student community, restoring affordable childcare services and student housing, and ensuring all graduate workers have full tuition waivers, no supplemental fees, and subsidized health insurance.